People reading today's Lancashire Evening Post will see Cliff Fazackerley, of the Ribble Link Trust's letter making the false claim that a barrage that raises the river level can somehow protect us from flooding. "I am sure the people who live in the lower Penwortham and Walton-le-Dale areas would prefer a 'Save our homes' campaign before a 'Save the Ribble' campaign." He points to rising sea levels and global warming and argues that Riverworks would be the way to protect us from this. "The 21st century is here and unless we act soon parts of our area could see flooding like we have never seen before." The places that are MOST at risk from tidal flooding from the Ribble are Crossens, Southport, Hesketh Bank, Hundred End, & other lower-lying communities, all DOWNSTREAM of the proposed Riverworks barrage - any barrage would INCREASE the floodrisk to downstream communities. The simple truth is however that such a barrage would offer NO effective protection from tidal flooding to people in Preston, Penwortham and Walton Le Dale as it would have already raised the river to high tide level, and that it would INCREASE the risk of river flooding during periods of heavy rain or snow melt because it would be a barrier preventing the free outflow of spate waters. (Not to mention other effects of a barrage such as raising the ground water beneath our homes). Anyone who has seen the raw power of the Ribble in spate understands how stupid it would be to put any kind of barrier in between all that water and the sea. If Mr Fazackerley's predictions about global warming are true, then the river is likely to be in spate more often and more severely, making a barrage or weir even more dangerous to local people. Those in favour of the Riverworks scheme include Architects and Property Consultants who stand to gain considerably from such major buliding developments, unlike local people who will see their valued green spaces disappear under housing and roads. The fact that these individuals are resorting to scaremongering in order to try to terrify us into supporting their unpopular development plans is a sign that they know they are losing the argument. 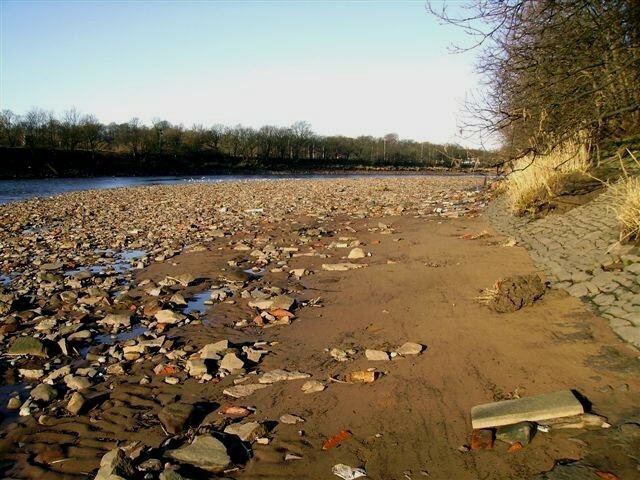 The River Ribble Weir Appraisal offers clear, well documented evidence that any weir or barrage across the river raises the flood risk to local people. If the Ribble Link Trust, the Vision Board and our Council Officials had actually read this document, they would know that the whole idea of a barrage is impractical and dangerous to local people. That's why the Save The Ribble Campaign is campaigning to defend local residents' homes from the increased flood risk that would be caused by the Riverworks barrage, and increased further by building 4000 houses in it's floodplain, as well as to save our beautiful river from what would be an unmitigated ecological tragedy. 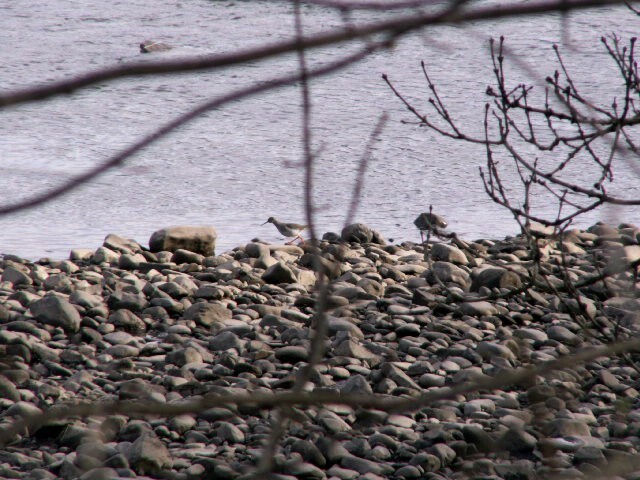 The interests of local people, and the interests of our river's ecology are one and the same, and we are certainly not going to be railroaded into supporting the irresponsible Ribble Barrage scheme by Mr Fazackerley's wild and unsubstantiated scaremongering. 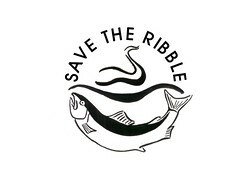 The people who live near the River Ribble are a key part of it's environment, just as much as all the fish and the birds it supports, so let's save the Ribble, and our homes, by putting a stop to the Council and Vision Boards' schemes to build this barrage once and for all. RIVERWORKS, WHO STANDS TO GAIN: PROPERTY CONSULTANTS OR THE ENVIRONMENT? 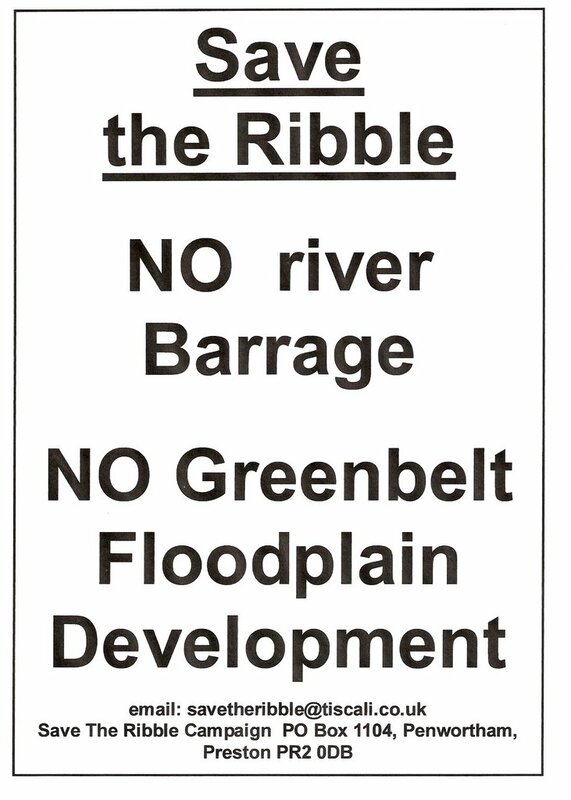 Property Consultant, architect, and Riverworks supporter Tarquin Scott has presented his vision for the development of the River Ribble and Green Belt, and derides Save the Ribble Campaign’s concerns as “flawed” (Lancashire Evening Post, “River Quibble” 21/2/07). Mr Scott’s article suggests that a key aim of Riverworks is to “conserve our environment”. Mr Scott’s arguments indicate that he has not read the Riverworks documents properly since these make it quite clear that the objective of Riverworks has nothing to do with protecting the environment and everything to do with “creat[ing] development opportunities on a regional scale”. Furthermore, Mr Scott’s article suggests that he does not understand the full environmental impact of the proposals themselves. - Mr Scott argues that since the River Ribble has already been interfered with by human development since the 19th century (specifically the dock development and canalisation and diversion of part of the River) this excuses and justifies “further adaptation” by the construction of a barrage. This argument is about as logical as saying that since we have already been cutting down rainforests we might as well carry on since we have already had an impact on this environment. Mr Scott recognises that these past developments “must have altered the nature of the estuary to an unknown degree”. 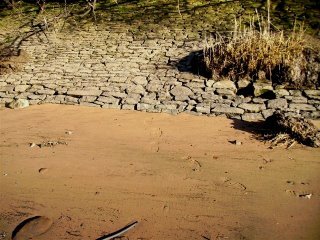 However, he does not acknowledge that in the decades since the dock closed the Ribble has recovered to such a significant extent that it is now the most important estuary River in Britain, probably Europe, for wildlife. 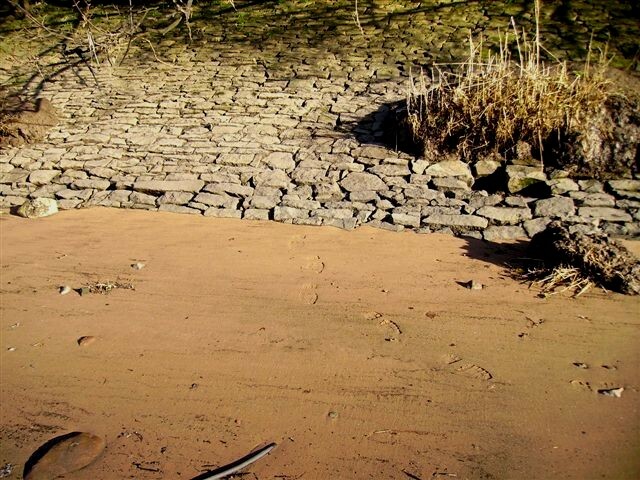 The lowest section of the river channels are now reverting to their original state and the Ribble is now recovering well from the past impacts on its ecosystem, its mudflats and saltmarsh areas showing positive recovery rates. 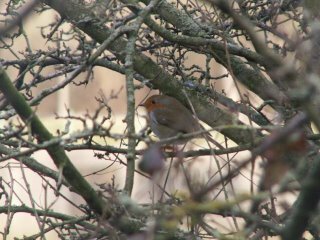 The river’s quality is good, fish stocks are better than they have been for decades, and the numbers of bird species which the Ribble supports now place it as an Internationally important Wetland. The construction of a barrage would cause significant changes to this delicately balanced inter-tidal ecosystem, the full impact of which could be devastating to the environment. 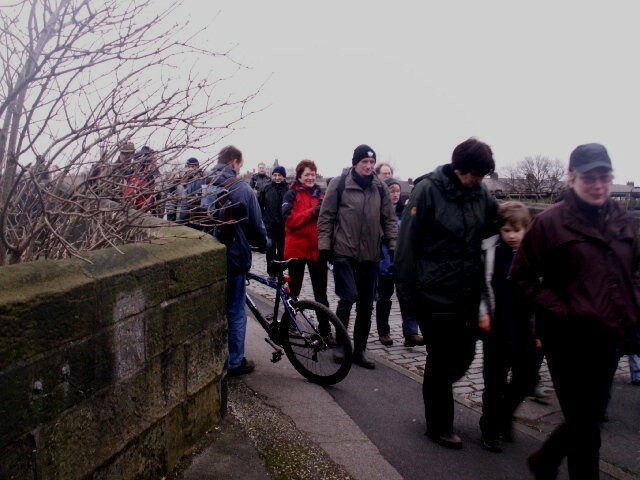 It could also increase the floodrisk to several communities in the Ribble corridor. This is why so many local people, environmental organisations, several other Borough Councils which border the estuary, and a growing number of local councillors are opposed to it. Current Environment Agency and Defra policy regarding the River Ribble is NOT the “further adaptation” of our “much altered river system” but managing the Ribble as a precious resource through the natural management of its environment and flood defences. This involves ensuring that the precious environment is protected from further human interference and the effects of climate change, as well as ensuring local communities are protected from flooding. This objective is actively pursued by returning areas of farmland to the Ribble’s intertidal zone, the latest of which is happening at Hesketh Out Marsh, just downriver of Penwortham and Preston. This policy, rather than building barrages, has been identified by the EA & Defra as the only viable and sustainable way forward both environmentally and economically. The Ribble at Hesketh Out Marsh. - Mr Scott and the Riverworks documents argue that constructing a barrage in the dock area “would create a navigable waterway between Junction 31 of the M6 and the dock entrance”. Mr Scott, Preston City Council and Preston Vision Board envisage local people using water buses to commute to work instead of driving. Nice idea, but Preston isn’t Venice and clearly Mr Scott et al are ill-informed and do not understand either the geography or the nature of the Ribble. One crucial fact that Mr Scott and others are ignoring is that because of the geographical fall of the Ribble between the Tickled Trout and the estuary, one barrage would not be enough to create a navigable waterway without causing permanent flooding to Penwortham and Hutton. A consultation document commissioned by Preston Council in 1986 showed that there would need to be a minimum of two such structures, ideally four, to even potentially navigate the whole stretch. This report concluded that even with four weirs or barrages, “access by boats from one stretch of water to another would be difficult and restricted to periods of very high water levels”, and even then “in places the River remains relatively shallow” and therefore un-navigable ("River Ribble Weir Appraisal", Halcrow 1986). The same report points out that “the raising of water levels by a weir over low tide water levels is of major concern” as high river levels significantly increase the risk of flooding from waters flowing down-river. As such any weirs or barrages on the Ribble “would need to be gated so that the retained water level can be lowered in advance of heavy river flows”. The report recognises that the gates would need to be left open for significant periods of time, even months on end, therefore any potential navigation would be limited to favourable weather conditions. Water buses on the River would therefore be at best unreliable, and even when running, would take a very long time indeed to negotiate the necessary gates through the weirs from one stretch of river to another. - The rather contorted nature of Mr Scott’s environmental benefits argument is further illustrated by the aim of integrating the barrage “with a new lower Ribble crossing to link Liverpool Road with Riversway”. As many studies have consistently shown further road building simply encourages increased car use. 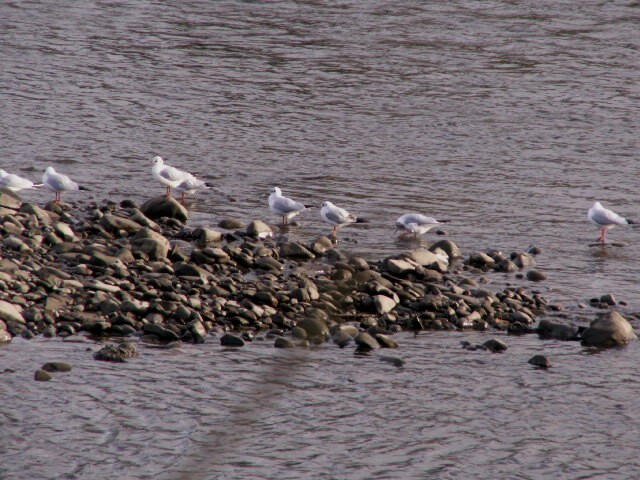 - Mr Scott accuses Save The Ribble Campaigners of assuming “that a barrage” would be a concrete eyesore” and argues that “in addition to providing an iconic and eye-catching design, there is no reason why measures to accommodate inter-tidal marine life and wildfowl in the River Ribble cannot be incorporated”, and even suggests “the barrage could be an ideal location for a centre to inform visitors of the wildlife in the vicinity”. We are not sure how Mr Scott reconciles this version of a barrage with his integrated road crossing. 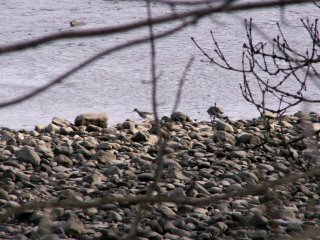 Presumably, in between dodging the traffic on the road crossing and the visitor centre car park, visitors will have the opportunity to find out about the wildlife the Ribble used to support before the barrage was built. 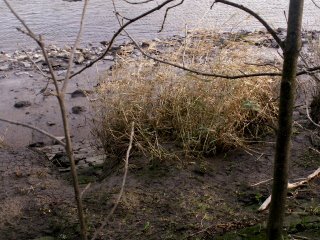 A barrage cannot be reconciled with inter-tidal marine life as it would directly interfere with the River’s intertidal ecosystem. 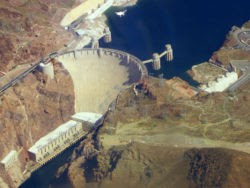 Mr Scott suggests that engineers building a barrage should look to “beautifully designed solutions” such as America’s Hoover Dam for inspiration. Considering the Hoover Dam is 221.4 metres high, 379 metres long and has flooded 110 miles of river valley perhaps planners in Preston would be thinking on a slightly smaller scale, but nonetheless any such structure would hardly be sympathetic to our local environment. The Hoover Dam: An inspiration for Preston? Actually, opponents of a barrage on the Ribble would not care if it was the most aesthetically pleasing structure in the world. Whilst it is the case, incidently, that a barrage would destroy the aesthetic qualities of an ever-changing natural river environment, we are predominantly opposed to the barrage quite simply because of the environmental damage it would cause. 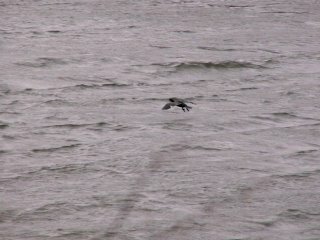 - The other environmental benefit Mr Scott proposes is that the barrage could be used to generate hydro-electric power. In fact a barrage on the Ribble would only be able to generate such a comparatively tiny amount of power (unless they do intend it to be the size of the Hoover Dam) that any environmental benefit of this would be dwarfed by the enormous environmental damage it would cause. - Finally, Mr Scott briefly addresses the issue of building 4,000 houses and businesses on the Ribble floodplain in Penwortham. He says “I partly agree with their environmental concerns, but again consider that a balanced analysis must be addressed before consigning the Riverworks proposals to the bin”. However, the Riverworks argument’s assumption that all those new residents would work in Preston and would walk or cycle to their places of work, and therefore reduce reliance on cars, is by no means certain, and this still does not address the increased floodrisk problems facing these same new residences and all other existing communities in the area that would be caused by building on the floodplain. The development would also destroy a large area of designated Green Belt, which includes our sports pitches, allotments, and a diverse range of wildlife habitats which are of enormous value to local people on both sides of the River, and to the environment. Hardly beneficial to the environment, and certainly not sustainable development in any shape or form. The idea that Riverworks will benefit the environment by discouraging car use is frankly ludicrous. Not only will the new floodplain housing and business developments increase the volume of traffic in the area, but creating a water sports venue on the River will attract even more cars to the area, quite apart from the pollution and noise caused by the various motor boats themselves. There would also be the ridiculous situation where local people both sides of the Ribble who currently walk and cycle by the Ribble and Green Belt for peace and fresh air and the sounds of running water and bird song would have to get in their cars and drive somewhere else to find what is currently on their doorstep! Mr Scott ends his argument by claiming that “in an ever changing world, doing nothing is tantamount to moving backwards if we wish to conserve our environment”. Is he seriously claiming that by NOT building a barrage on the Ribble we will actually be causing harm to the environment? How, exactly? Current policy is NOT about “doing nothing”, it’s about acting positively in conserving the Ribble’s irreplaceable intertidal habitat at the same time as protecting our communities against the impacts of climate change – positive actions which are genuinely sustainable in environmental and economic terms, for now and for the future. One wonders what Property Consultant Mr. Tarquin Scott's own stake in Riverworks is...? It is not surprising that Property Consultants and developers should support the Riverworks proposals: they stand to make millions of pounds from building a barrage on the Ribble and developing enormous housing and business developments on our Green Belt and floodplain. People like Mr Scott, Preston Council and the Vision Board can dress up the Riverworks proposals all they like: any claim that the scheme will be of benefit rather than harm to the environment is clearly nonsense. Guide to Local Development Framework Consultation: Have YOUR Say, Now! Whilst there is a confusing number of documents available on the LDF consultation website, you only need to look at the Core Strategy Issues & Options Paper ("CSIOP" which is Document 2 on the downloads link) to be able to complete the Response Form (Document 1). !! And the LDF consultation includes mention of and even unsubstantiated claims about Riverworks – both overtly (see p10, and p46 point 5.15 in the Core Strategy Issues and Options Paper ("CSIOP" Doc 2)), and somewhat hidden from obvious view - see discussion below regarding Flooding: Issue 5F, Option C, see p35 in the Core Strategy Sustainability Appraisal ("SA" Doc 3). - er... but only if you don't wreck these by building a barrage and massive housing and business developments on them!! Preston: Wednesday 21st March in Meeting Room A, Town Hall, Preston ANYTIME between 4 – 7pm. **By filling in a Response Form - to be completed by 30th March 2007 – so don’t delay, DO YOURS TODAY! – and pop along to one of the Drop-In Sessions to have your say there too! Monday 19th March, Lancashire Football Association HQ, Thurston Road, Leyland, 2-4pm. Theme 1 : Locating New Development. 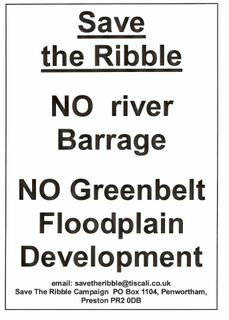 The greatest concerns for Save The Ribble here are protecting our valuable Green Belt from development. For 1C: we chose answer E “somewhere else” as development on Green Belt land should be avoided. Green Belt land should be safeguarded for local people and our environment now, and for our future sustainability. Issue 5: Protecting the Environment. We agreed with the Core Strategy as protecting the environment must be a priority. Obviously we should be protecting ALL sites of local biodiversity or geological importance from development – as well as sites on National and International ecological importance! We also feel that we should protect our landscapes based on their intrinsic value, and their biodiversity and environmental significance, not just for the potential recreational or agricultural value for people. Small-scale renewable energy schemes should be mandatory on all new developments regardless of size, and should be the focus of priority development on all existing buildings, both residential and business, with encouragement and grants from Local Authorities. - ‘the scheme would have a significant positive impact as it promotes the development of land, which has previously been unsuitable’. Clearly all of this claims are unsubstantiated, and we have highlighted our concerns about these suppositions on several levels, not least that the evidence suggests that our flood risk could actually be increased and that this so-called 'unsuitable' land is actually our valuable Green Belt and Floodplain!! c) This ‘unsuitable land’ is designated Green Belt, includes football pitches, allotments, a Local Nature Reserve, Biological Heritage Sites and Priority Biodiversity Action Plan Habitats, agricultural land, and valuable countryside areas which offer easily-accessible and high value green amenities to local people. It would also continue to be a floodplain as it is the river’s floodplain, not the sea’s floodplain! d) As the LDF is a development strategy looking at planning issues and themes for development in general terms and regarding development principles, why is a specific project and its unsubstantiated claims being considered here? e) Would responses choosing Option C unknowingly be choosing the Riverworks option? As the Sustainability Appraisal (Doc 3) was not sent out with the Core Strategy Issue & Options Paper, is only available online, and is only one of several documents, most people may not even read it. ‘Option (c): Promote major schemes such as Riverworks to manage river flooding to such an extent that otherwise unsuitable land could be made available for development. Riverworks is a major scheme and although it may have a significant positive impact on environmental criteria by virtue of improved management to river flooding, there are other considerations to take into account, such as the impact of the works on the biodiversity resource, the landscape character and green belt. 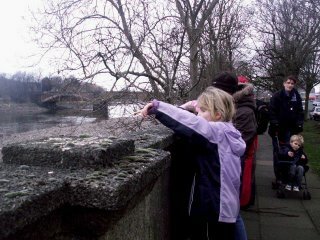 This option is closely linked to Issue 4C Option g) concerning a new river crossing across the River Ribble. It is unclear whether the land in question is identified as previously developed, but where it is, this would have a significant positive effect upon environmental criteria. There would be a minor positive impact on social criteria because the risk from river flooding would be reduced. In respect of economic criteria, the scheme would have a significant positive impact as it promotes the development of land, which has previously been unsuitable.’ ("SA" Doc 3, p35). Clearly these are seriously unsubstantiated and potentially disastrous assumptions which cannot be left unchallenged! As far as the rest of the consultation goes, we argue that our quality of life is also very important, and is intimately related to our concerns about the threats posed to our environment, and to what appears to be a fairly minimal focus in the LDF on actively improving the lives and local environments of all of our citizens, for now, and in the long term. Theme 2 issues: Meeting Housing Needs. … which leads us particularly to Issue 2D, for which we chose Option A, as we must always consider Previously Developed Land first. Theme 3 issues: Fulfilling Economic Growth. -WHY IS THE CENTRAL FOCUS OF THE LDF AN INCREASE IN ECONOMIC GROWTH IN THE USUAL TERMS? 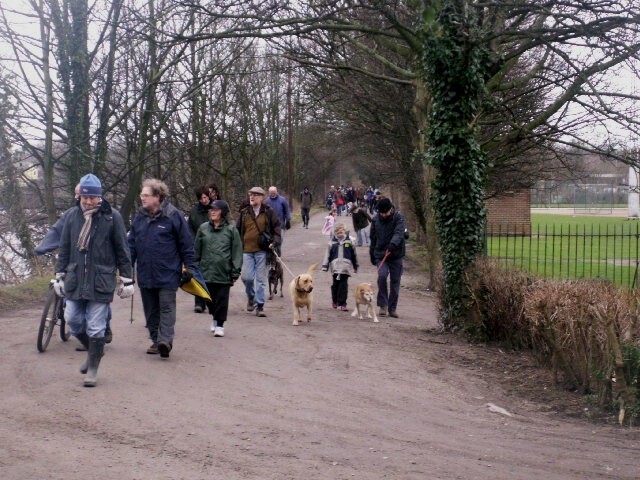 - that leisure resources for local people, our green spaces and amenities should be protected from development to ensure this valuable resource remains accessible to all. Theme 4 Issues: Improving Accessibility. For Issue 4C: we chose answer J, the combination measures but commented "except absolutely NO to Option G, a new crossing over the River Ribble, as this would cause unacceptable damage to the environment, both the River itself and the local green belt". - Nor should the motorway networks be increased (no to H), nor create more direct road links to the airports as we need to also reduce the growth in flying (no to I). - We welcomed Option F in these comments as the provision of an integrated network of cycle and walking routes, alongside real investment in Public Transport, is essential. There are real issues to be addressed in both our rural and urban communities, and these should be addressed at the same time as we consider the urgent necessity of protecting our environment in local, national and global terms. Current levels of growth are proving to be unsustainable in terms of environmental impact (both global warming and local environmental depletion, traffic congestion etc), and for the economic life of deprived areas of the community. As this area of Lancashire already has strong growth, the emphasis needs to be on actively reducing our environmental impact (actively reducing our carbon footprint and local environmental impact), whilst actively seeking to tackle the real deprivation that exists in some of our communities as the “trickle-down” effect does not work. An alternative and positive Strategy would benefit existing and future communities, as well as our economic and environmental sustainability in the long-term (see the Stern Report). TRY TO MAKE TIME TO COMPLETE THE RESPONSE FORM, by 30th March! Save the Ribble welcome Councillor Jack Davenport's letter in the LEP on 8th February in which he expresses his concerns about the potential environmental impact of aspects of the Riverworks project on 'the wildlife and natural splendour of one of Preston's most glorious jewels': The River Ribble. Jack Davenport's concerns echo fellow Preston Councillor John Swindells' concerns about the potential impact on our precious environment, as, whilst Jack Davenport does not explicitly express opposition to the Barrage proposal, he welcomes some of the 'benefits that [Riverworks] could bring, especially... regeneration, leisure and community facilities' (as we all do - in the right place!!) and he warns that 'development of the River Ribble itself needs much more thought than has currently been given. The environmental consequences if it goes wrong are too awful to contemplate’. 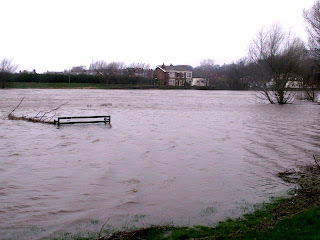 ‘Flood defences must be updated, especially in the face of climate change, especially as the Ribble is a tidal river. This does not mean though, that we should endanger the environment in doing so. It is no good sacrificing one area’s environment to save another. A solution must be found that protects residents from the risk of flooding, but maintains as much as possible of the wildlife and natural splendour of one of Preston’s most glorious jewels’. It is timely indeed that Jack Davenport’s letter should coincide with the announcement today that work is to begin on Hesketh Out Marsh within the next month, a project to return this drained marsh to the tides and the wildlife of the Ribble at the same time as the resultant Nature Reserve of saltmarsh and mudflats will effectively and directly increase the area’s protection against flooding! The newly-created 168 hectares of mudflats and saltmarsh area will increase the flood defences for Preston and South Ribble, West Lancashire and even the Fylde coast! The Ribble Shoreline Management Plan, Defra and the Environment Agency have all identified the further creation of saltmarsh and mudflat wetland habitats as the most environmentally and economically sustainable – and most effective – means of protecting our Ribble communities from flooding in the long term. The Ribble Shoreline Management Plan DOES NOT ADVOCATE THE NECESSITY FOR A BARRAGE ON THE RIBBLE TO PROTECT ANY COMMUNITIES FROM FLOODING. It does, however, advocate the further creation of new saltmarsh and mudflat wetlands on the Ribble as the most effective, sustainable, and cost-effective means of DEFENDING ALL RIBBLE COMMUNITIES FROM RISING SEA LEVELS. David Borrow, MP for South Ribble, raised the issue of Hesketh Out Marsh at Prime Minister's Questions this week, and Tony Blair commended the scheme. Jack Davenport concludes his letter by saying that Riverworks ‘must happen in a way that strives to increase protection of the city, encourages development and investment, but does not sacrifice the environment and natural beauty of an important part of Preston’s heritage’. - Sentiments with which we agree – for the sake of all the communities who live alongside the Ribble, and for the sake of this glorious jewel! While we warmly welcome our councillors concern for the potential environmental impact of some of the Riverworks proposals, we remind them however that local people will ultimately judge them on the position they take on the barrage proposals and the proposals to build over 4000 houses in the floodplain - issues that apart from Councillor Swindells, few others have yet taken a clear position on. and more about why saltmarsh and mudflats are so important! 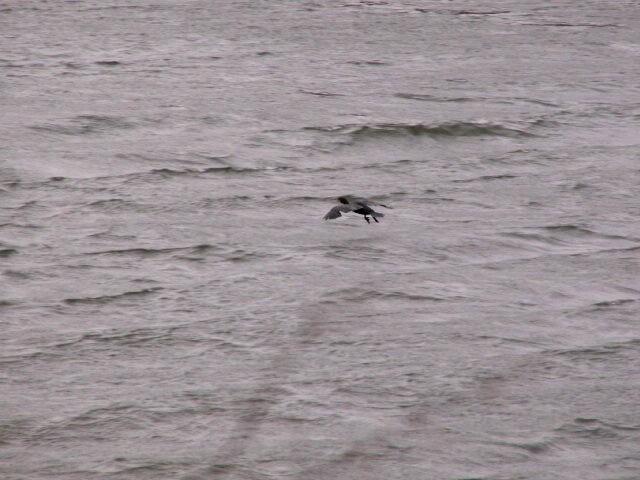 I have just been looking at your blog of the rough weather on the river. 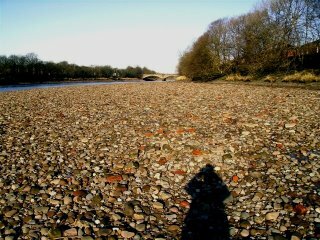 This morning, on impulse, I climbed over the wall at Broadgate and made my first return to the river bed in forty-eight years. 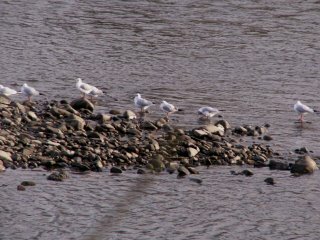 I took these pictures which shows that the river is not always a dirty muddy place. No doubt the storm water cleaned it all up, but I had an nostalgic half-hour walking up the river bed toward the New Bridge before the incoming tide made me turn back. The morning of Tuesday, January 22nd, 2007 was one of those beautiful winter days when the sky was clear blue and free from cloud. The lawn had a covering of light frost and the water in the pond was frozen over. There was a distinct icy chill when I set off on my weekly visit to the Preston City Market. On my way back, thinking about the plans to build a barrage across the River Ribble, I decided to take a walk along the banks of this splendid river which the developers are seeking to flood for ever. 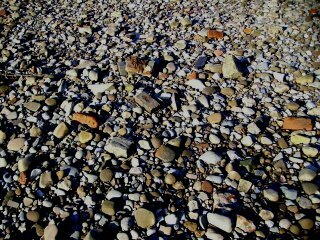 Parking along Broadgate, I recalled my schooldays when every possible leisure hour was spent playing amongst the mud, sand and stones of the river bed. I was not alone in this, summer evening and week-ends often found dozens of children down on the banks either building obscure structures from the thousands and thousands of house bricks which littered the river bed. Those were the first dozen years after the end of World War II. A lot of the terraced houses alongside the river had been fitted with brick air-raid shelters. Once the war was over, and despite the fact that most people wanted to keep their shelters as handy “outhouses,” the authorities in their “wisdom” declared that they should all be pulled down (probably at great expense). The resulting rubble and bricks were simply dumped into the river where they gave endless hours of enjoyment to the local children. I recalled that the last time I had been in the river bed was in early 1959, shortly before I went off to Merchant Navy training college at Wray Castle on the side of lake Windermere. When I climbed over the wall 48 years ago, I clearly remember thinking that that part of my life was over and never again would I enjoy the pleasures of the river. I was then aged 15. 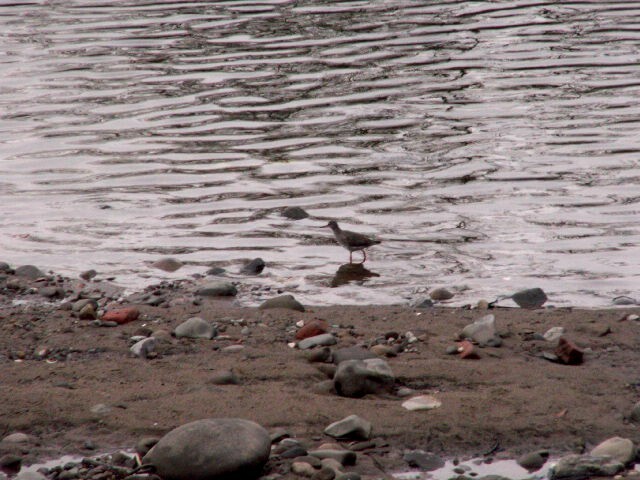 Most of the time these days, the river bed is heavy with mud, but I was delighted to see that the day of my visit was one of the periodic times when everything was bright and clean with sand where there is usually mud. No doubt a result of the fierce storm of the previous week. Placing my hat and coat in the car, I leapt over the wall. Maybe not with the agility I displayed forty-eight years ago, but easily enough, nevetheless. 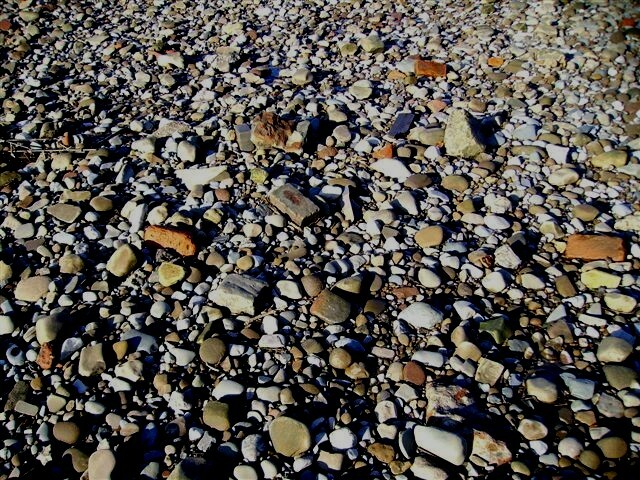 I scrambled down the sloping stonework finding myself on a rather pleasant mini beach. Having heavy boots on, I had no difficulty in walking along the uneven stones and took a nostalgic stroll along the river bed in the direction of the New Bridge. Everything was as I remembered it and I enjoyed the clear, fresh air and absence of traffic noise. 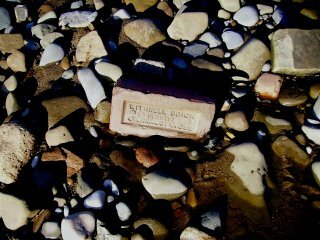 Even the thousands of bricks were still there, many of them worn smooth with the passing of over sixty years. 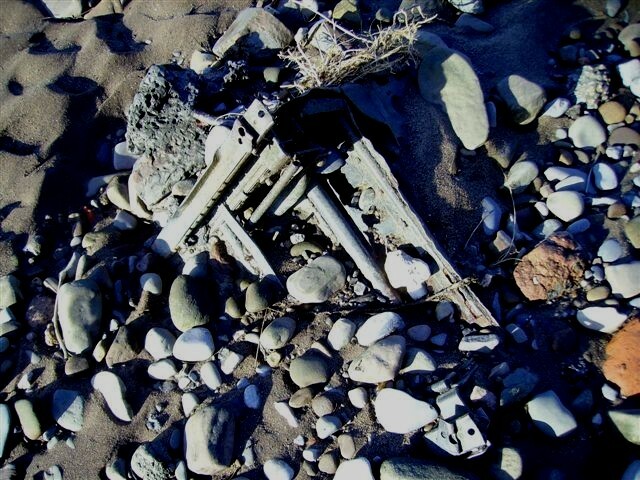 Occasionally, I would come across some interesting piece of mechanical junk embedded in the stones reminding me of finding my first old radio set in the river well over 50 years ago. It was that radio set, plus a general love of water, that set me off on what was to be a 31-year career as Merchant Navy ship’s radio officer. As I approached the New Bridge, it seemed that the tide was coming in. This is never a very rapid process and there was no danger of me being cut off, but I made a leisurely return to the small beach where I had climbed over the wall. There were no other footprints along the bed, other than those of birds, none of whom seemed to resent my intrusion. There were no signs that any children had played down here for many a long year – too dangerous I suppose, in an age where it is more fun to fight a battle on a computer monitor against grotesque space aliens without the fear of any fatal or painful consequences. Had the tide not have been coming in, I would have stayed a lot longer. Returning over the wall was easier than going over from the pavement because of the build-up of general rubbish behind it - another sign of the times! The whole visit was invigorating and enjoyable. Nevertheless, I find it sad that there are plans to drown it all with a barrage. There were similar plans fifty odd years ago, but they all came to nothing. It seems clear to me that a river that floods its banks from time to time when there is nothing in it to restrict the water flow after heavy rain will be even more likely to flood if a great barrage is placed in it to increase its depth!" 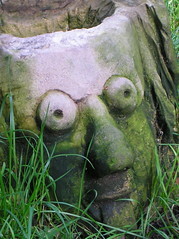 You can see more Tales and Pictures from the Riverbank here. 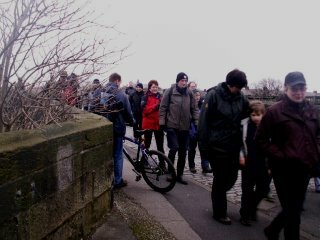 The Save The Ribble Winter Wildlife Walk on Sunday 28th January, in which we were joined by the Preston Society, was a great afternoon out by the Ribble. More than 50 assorted local Penwortham and Preston residents (with assorted pooches and pushchairs) walked from the Old Tram Bridge downriver to Priory Park, then back upriver and finishing just past the Broadgate mudflats on Old Penwortham Bridge. The Kingfishers by the Tram Bridge were ever elusive (except when you least expect them of course! 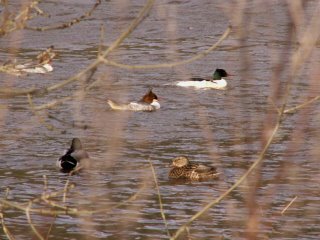 ), but Goosander were around from here right down to the furthest end of the walk, as was a Moorhen and a good number of Mallard. ...down through Penwortham Holme and past the Broadgate mudflats on the opposite side, over Liverpool Road and downriver past the mudflats and shingle banks to Priory Park… a number of Redshank and most of the Cormorants flew off downriver as we approached (not keen on large-group watching, obviously!) 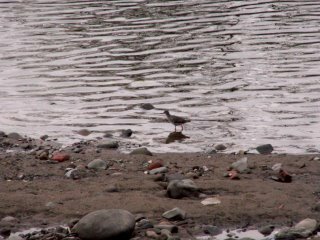 although one keen angler did come back and continue fishing for his supper. 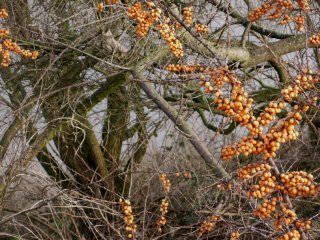 Winter food and habitat for hedgerow and farmland birds, many resident all year round, and many migratory species who travel for thousands of miles from Southern Europe, Scandanavia, and Africa (including crossing the Sahara Desert) to breed here in the Summer months. Hedgerow and farmland birds have declined by 50% in recent decades: we need to protect their habitats as a matter of urgency. 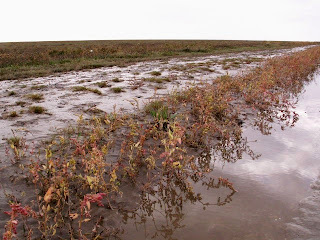 You can read more about why the Ribble's Saltmarsh and Mudflats are so important here. The Ribble's Winter visitors also include Mallard as these birds also migrate to Britain from Iceland, Northern Europe, and Russia in the Winter months to join our resident Mallard. Perhaps surprisingly, for such seemingly "common" birds, Mallards are another species which has been in decline in recent decades. Black-Headed Gulls - some already showing their breeding-season black caps as these, like many birds, are taking the unseasonably mild weather to be Spring, which could add to the problems many species face if they start laying their eggs before Winter finally arrives. On the way back upriver, the group dispersed even more as the keen walkers walked keenly and the lingering lingered… and were rewarded with a good number of Redshank with the Mallards and Blackheaded Gulls on the Broadgate mudflats – the Redshank are not only shy but very difficult to spot unless they are on the water line as they blend in with the mudflats and stones so completely so much more difficult to spot… they were probably there all the time! Thanks Stephen, and your colleagues from the Society who also joined us - if anyone would like to know more about the Preston Society, they can find it at www.prestonsociety.co.uk . 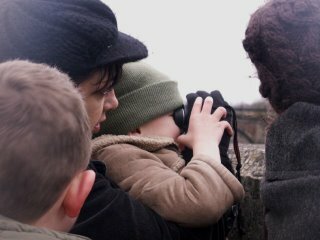 Thanks to everyone who joined us on our Ribble Winter Wildlife Walk – see you for our next event in early Spring when we’ll be walking upriver to Brockholes: this will be an all-day event as we’ll want to spend a good while at the new Brockholes Wetland Nature Reserve that local Ribbleside people helped the Wildlife Trust to save!